"Lord Krsna is worshiped by the best of the yogis and is the son of Nanda. He removes all the fears of the inhabitants of Vraja. He is the color of a fresh rain cloud, and His form is enchanting. When He wanders about, playing His flute, He looks very charming. "He is the son of Yasoda and the killer of King Kamsa, and He sports in the rasa dance among the groves of Vraja. Krsna engages in this rasa dance underneath the kadamba trees, and He resides in the forest of Vrindavana. "He increases the ecstacy of His devotees. He is the reservoir of all love and is the transcendental Cupid who uses His flowered arrows to increase the loving desires of the gopis. He is the pleasure of the gopis' hearts and the abode of all wonderful qualities. "Lord Krsna is the life of the River Yamuna. 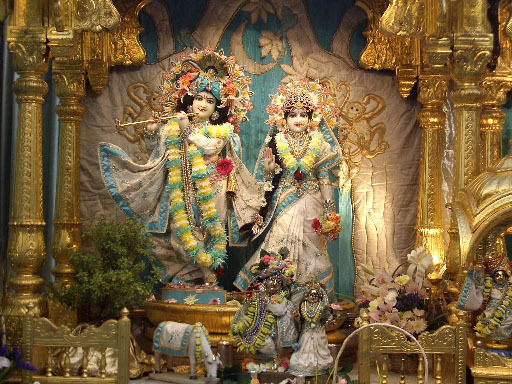 He is always absorbed in amorous pastimes, and He is the moon of the gopis' minds, which are like the cakora birds that subsist only upon moonlight. O mind, obey these words of mine and sing the glories of Sri Krsna in the form of these holy names, which are full of nectarean mellows."